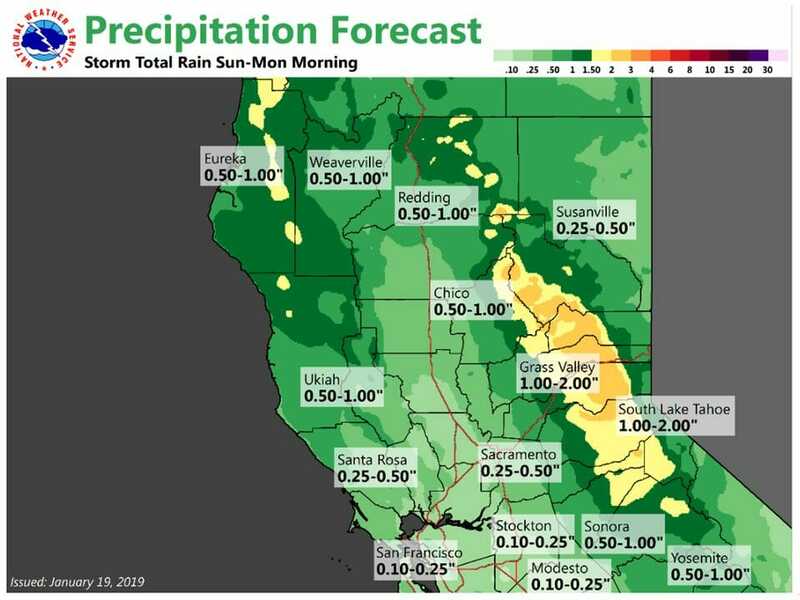 January 19, 2019 – Light precipitation for areas north of interstate 80 through Tonight. 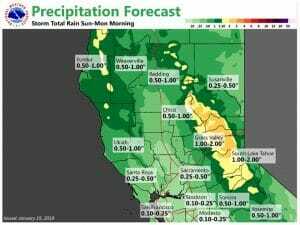 Widespread precipitation returns Sunday, with hazardous mountain driving conditions. Drier conditions return Monday through the end of next week. Night and morning valley fog likely. Very isolated and light warm frontal precipitation is falling over the forecast area this morning. Otherwise, weak high pressure over the west coast is allowing for mostly cloudy skies over the CWA. Light precipitation will continue to be a threat mainly north of the interstate 80 corridor through the day. Despite cloud cover, daytime highs today are forecast to come in a few degrees above normal for this time of year. Another mainly cloudy night expected tonight before a moderately strong Pacific cold front moves on to the coast Sunday morning. Snow levels with this fairly warm system will start out above about 6000 feet so only the highest elevations are likely to have travel impacts. Main travel impacts will be over the Sierra where passes will be above the snow line. Latest models show moderate precipitation over the Sierra Cascade range as early as 15z Sunday morning. Have therefore pushed up winter storm warning currently in place by a few hours to cover earlier onset of precipitation. 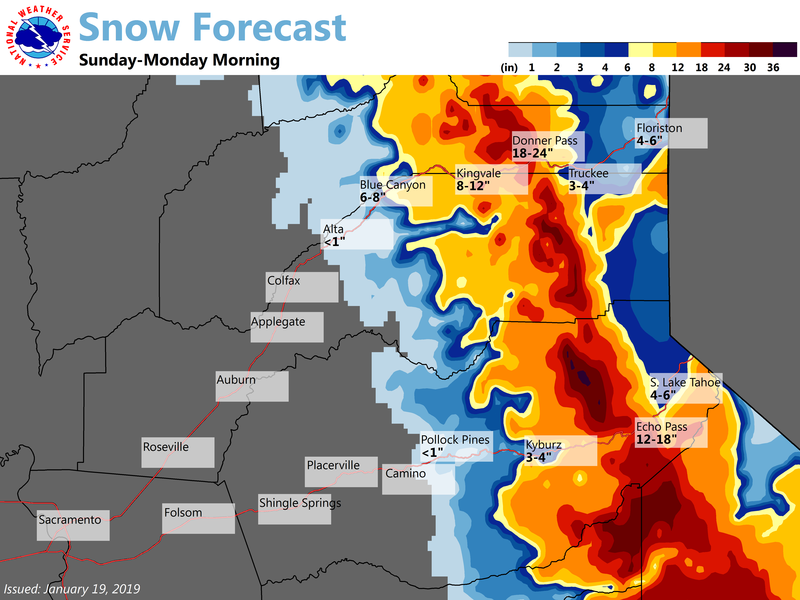 Moderate snowfall and breezy south winds will make for hazardous travel conditions over the Sierra into Sunday evening. Cold air filtering in behind the front will bring a drop in snow levels Sunday night and could see some light snow down to 4000 feet elevation by Monday morning. Main upper low shifts into the Great Basin during the day on Monday with a shift to northerly flow bringing drying during the day most areas. 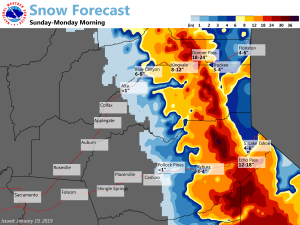 For the most part, only the Sierra Cascade range should see a threat of precipitation on Monday. Building high pressure, northerly winds and clearing skies will bring warming on Tuesday. 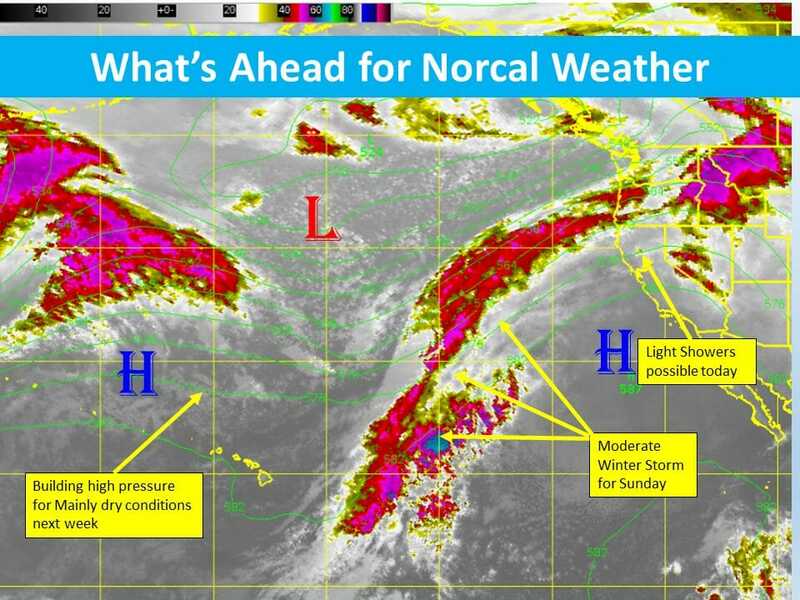 This strong high pressure ridge over the eastern Pacific and west coast will bring the start of a warm dry period lasting through the coming week. Dry weather prevails through the extended forecast period as high amplitude upper ridging in EPAC is main synoptic feature. Ridge axis remains off the West Coast through the remainder of the week, shifting inland next weekend. 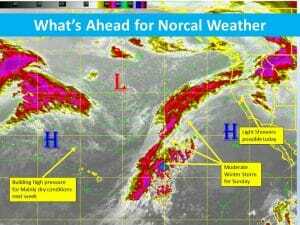 Pattern will be conducive to the formation of areas of night and morning fog in the Central Valley and mountain valleys. Above normal daytime highs expected with 60s in the Central Valley and 40s to low 60s for the mountains and foothills.